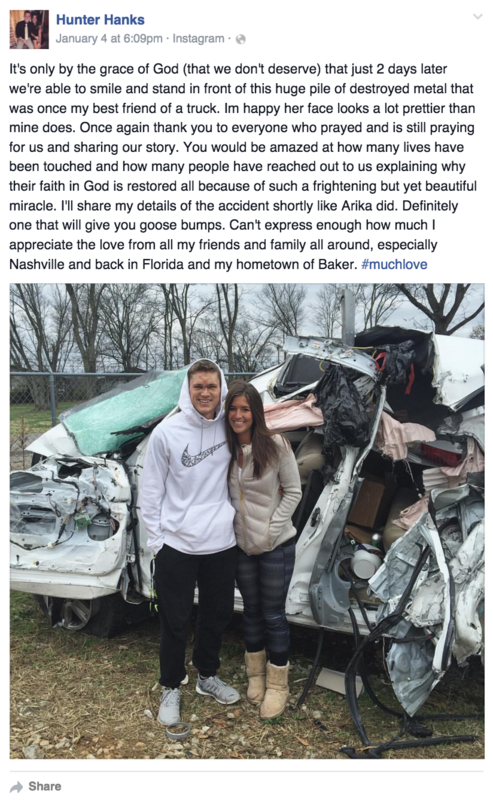 Tennessee Christians Thank God for Taking the Wheel and Crashing Into a Pole at 85 m.p.h. It’s always good to see two young people survive a horrific crash with minimal injury. But when God gets thrown into the story, the explanation of how they survived raises more questions than answers. Hunter Hanks was speeding on a Tennessee road in his truck with his girlfriend Arika Stovall when he crashed into a pole. They very well could have been killed, but the pole went through the truck between them, allowing them to make it out alive. I’m overwhelmed at how little damage was done to Hunter and I in a wreck that should have chopped our bodies in half. I’m in awe of the presence of God in this entire situation. Every part of this experience we went through points directly to Him. The way God helped Hunter to respond exactly the way he did behind the wheel, spinning the truck exactly where it should have to be able to smash into the pilar directly in the middle of me and Hunter so we were both untouched…that doesn’t just happen. God doesn’t throw protection around like that for no reason. He does it because he’s not finished with us. Nice job, God. You spun the truck so the pole smashed it in the middle. Somehow, with all Your power, you still couldn’t avoid the pole entirely. So much for omnipotence. It’s only by the grace of God (that we don’t deserve) that just 2 days later we’re able to smile and stand in front of this huge pile of destroyed metal that was once my best friend of a truck. So let’s recap, since these two refuse to admit any personal responsibility in the situation. Jesus took the wheel and drove 85 m.p.h. into a pole. Both passengers ended up in the hospital due to Yahweh’s guiding hands. The truck was destroyed beyond repair because God loves them. But they’re alive, so He gets all the credit. Again, they’re lucky it wasn’t worse and I’m sure they feel like someone had to be watching over them. But what’s infuriating as an atheist reading about the situation is how God only shows up in the story post-recovery. He’s absent in everything leading up to that point, even though, according to their own warped beliefs, he set into motion that awful accident. God must hate everyone who dies in similar situations, I guess. At least they didn’t hit another car and kill someone. Thanking God after that would’ve been a slap in the face to the victim’s family. January 9, 2016 Sen. Bernie Sanders: Merging Church and State "Is Not What Our Founding Fathers Wanted"